Wright’s Automotive Service has provided top quality San Leandro auto repair and maintenance since 1977. As a family-owned and operated shop, the business motto has always been to treat you like family. That is why our customers have continued to come to our shop for decades – we truly care about you and our technicians provide high-quality service for your vehicle. We simply won’t settle for doing any less than our best. Our newest owner, John Bridgwater, has had a passion for cars all of his life and began working at the shop in 2011. Now as the owner, John continues to uphold the same family values and high standards that customers have come to expect over the years. John has always wanted to know, “What makes it go?” At age five he took apart a mechanical adding machine just to see how it worked. Growing up his father would work on the family van and John would always be by his side asking questions and learning everything he could. In high school John got a job with a local tire company, not for money but for high school credit and for the experience. He got his first paying job in the industry in 1987 working for a chain store. His manager took him under his wing and taught him everything he knew. John was promoted from tire installer to technician within a year and began focusing on diagnostics. After honing his skills for a few years, John became lead technician at an independent shop in northern California. He also earned his first ASE certifications and began networking with other technicians and shop owners. Today he holds 49 of 50 possible ASE certifications and in 2015 John won the RepairPal / ASE Technician of the Year award from a field of 300,000. Therly Bridgwater takes care of our back office, making sure all of the details behind the scene are taken care of. 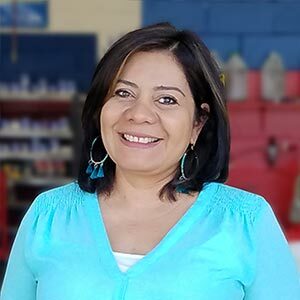 Her native language is Spanish, so she also serves as an interpreter for our Spanish speaking clients. She brings style and charm to the office, always smiling and happy. Victor Vanhille is our Service Manager. He has been with us since October 2015. He is a native of San Lorenzo and has many strong community ties, including San Lorenzo Little League both as a parent and a coach. He comes from a strong customer service background both self-employed and working for multi-billion dollar companies. He brings a great customer experience to this company as well and we are very happy to call him part of our family. 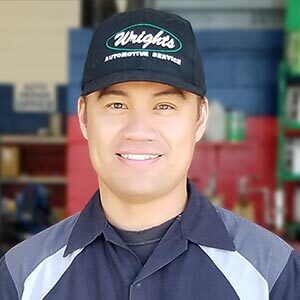 Kevin Olegario has been with Wrights Automotive since 2010, filling the position of Smog Technician. He performs most of our smog inspections and repairs as well as a good bit of our diagnostic work. 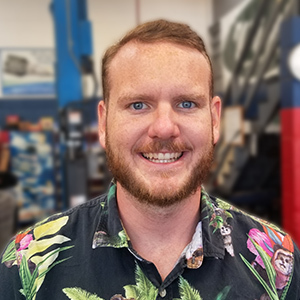 Being the Smog Technician, Kevin has a California enhanced smog license as well as lamp and brake licenses. Family is the most important thing to him. In his spare time, he likes spending time with his family and traveling to exotic places. Damon Russell has been with us since June of 2017. He has a rich background in many facets of running a shop. He has helped develop industry testing, has run his own fleet repair shop, and now brings his great skills to our team. 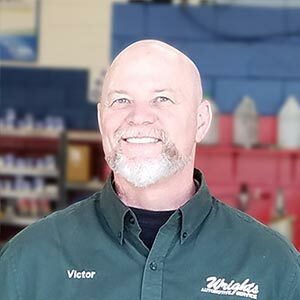 His position as shop foreman assures that things go smoothly, jobs are performed by the most qualified technician and we are able to maintain the top quality work you expect from Wright's Automotive Service. Kyle Abbas joined our team in June 2018. His warm, outgoing personality and excellent communication skills make him a perfect fit at the front desk. Be sure to say hi to him on your next visit. Nothing is quite like the feeling you get driving the open road in your car. A smooth-running, efficient and reliable vehicle will make the journey enjoyable, whether you’re driving to the corner store, to work in Davis Tract, or for 18 holes at Monarch Bay Golf Club. When your car isn’t working as it should, however, driving is anything but pleasant. 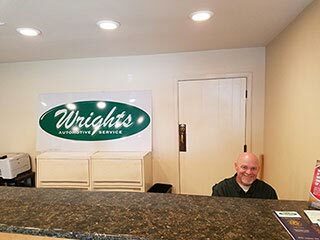 If you’re in need of auto repairs in San Leandro, trust the quality and experience of Wright’s Automotive Service. 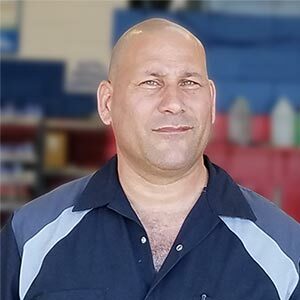 Since 1977, our honest, dependable team has been performing expert auto repairs and service for all our customers, while ensuring every interaction is courteous and friendly. We know you don’t want to make repeat visits for the same concern because of failed parts. That’s why Wright’s Automotive Service always uses high-quality aftermarket and original equipment parts and fluids for every auto repair. 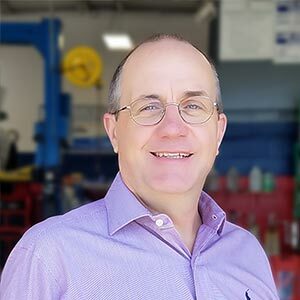 Hi, I’m John Bridgwater, owner of Wright’s Automotive Service. Thank you for visiting our website. Feel free to contact us if you have any questions and I’ll be happy to personally assist you.